For each product, SMAP L-band brightness temperature data from descending and ascending half-orbit satellite passes (approximately 6:00 a.m. and 6:00 p.m. local solar time, respectively) are assimilated into a land surface model that is gridded using an Earth-fixed, global cylindrical 9 km Equal-Area Scalable Earth Grid, Version 2.0 (EASE-Grid 2.0) projection. Data Contributor(s): Reichle, R., G. De Lannoy, R. D. Koster, W. T. Crow, J. S. Kimball, and Q. Liu. Reichle, R., G. De Lannoy, R. D. Koster, W. T. Crow, J. S. Kimball, and Q. Liu. 2018. SMAP L4 Global 3-hourly 9 km EASE-Grid Surface and Root Zone Soil Moisture Analysis Update, Version 4. [Indicate subset used]. Boulder, Colorado USA. NASA National Snow and Ice Data Center Distributed Active Archive Center. doi: https://doi.org/10.5067/60HB8VIP2T8W. [Date Accessed]. Soil moisture is output in volumetric units, in wetness (or relative saturation) units, and in percentile units (except surface soil moisture). Refer to the Data Fields document for details on all parameters. Parameters are further described in the Algorithm Theoretical Basis Document (ATBD) for this product under Section 3: Physics of the Problem (Reichle et al. 2014). For each 3-hour interval, there are two files: one geophysical (gph) file and one analysis update (aup) file. 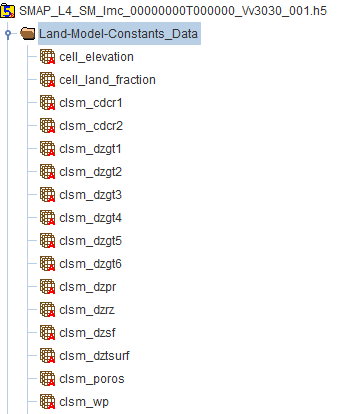 Land model constants (lmc) are provided in a single file per Science Version. Science Version IDs (such as Vv3030) are included in all file names, and are defined in the File Naming Convention section of this user guide. The Geophysical Data (gph) product includes a series of 3-hourly time-averaged geophysical data fields from the assimilation system, such as surface and root zone soil moisture. Figure 1 shows a subset of the gph file contents. Figure 1. Subset of the Geophysical Data File Contents. 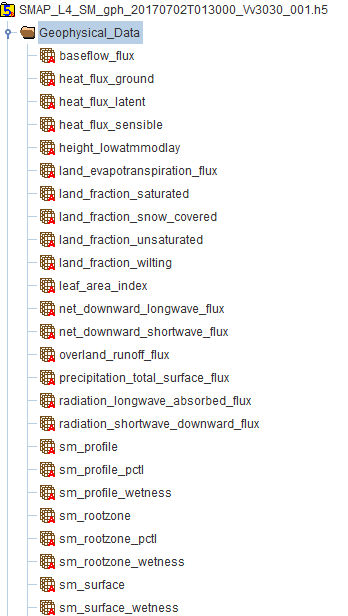 For a complete list of file contents for the SMAP Level-4 soil moisture product, refer to the Data Fields page. Figure 2 shows a subset of the aup file contents. Figure 2. 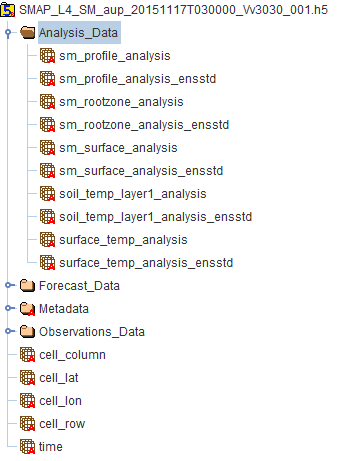 Subset of the Analysis Update Data File Contents. The Land Model Constants (lmc) product includes static land surface model constants that provide further interpretation of the geophysical land surface fields. Figure 3 shows a subset of the lmc file contents. Figure 3. Subset of the Land Model Constants File Contents. Each file contains the main data groups summarized above. For a complete list and description of all data fields within these groups, refer to the Data Fields document. All global data arrays are two dimensional with 1624 rows and 3856 columns (6,262,144 pixels per layer). Each product also contains metadata that describe the full content of each file. For a description of all metadata fields for this product, refer to the Metadata Fields document. The date/time corresponds to the center point of the 3-hourly time averaging interval. For example, T013000 corresponds to the time average from 00:00:00 UTC to 03:00:00 UTC on a given day. The date/time indicates the time of the analysis update. For example, T030000 indicates an analysis for 03:00:00 UTC on a given day. This analysis would typically assimilate all SMAP data observed between 01:30:00 UTC and 04:30:00 UTC. For the LMC product (time-invariant constants), which consists of only one file per Science Version, the date/time is 00000000T000000. Example: Vv3030 indicates a Validated-quality product with a version of 3.030. Refer to the SMAP Data Versions page for version information. Table 2 provides file sizes and daily volume estimates for each product. * Not a daily product. LMC data are provided in a single file per Science Version. Coverage spans from 180°W to 180°E, and from approximately 85.044°N to 85.044°S. The gap in coverage at both the North and South Pole, called a pole hole, has a radius of approximately 400 km. Coverage is for the global land surface excluding inland water and permanently frozen areas. The native spatial resolution of the radiometer footprint is approximately 40 km. Data are then assimilated into a land surface model that is gridded using the 9 km global EASE-Grid 2.0 projection. These data are provided on the global cylindrical EASE-Grid 2.0 (Brodzik et al. 2012). 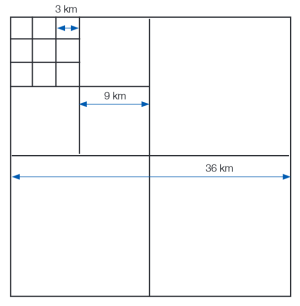 Each grid cell has a nominal area of approximately 81 km2 regardless of longitude and latitude. EASE-Grid 2.0 has a flexible formulation. By adjusting a single scaling parameter, a family of multi-resolution grids that nest within one another can be generated. The nesting can be adjusted so that smaller grid cells can be tessellated to form larger grid cells. Figure 4 shows a schematic of the nesting to a resolution of 3 km (4872 rows x 11568 columns on global coverage), 9 km (1624 rows x 3856 columns on global coverage) and 36 km (406 rows x 964 columns on global coverage). Coverage is continuous and spans from 31 March 2015 to present. However, gaps in the SMAP time series do not affect this product. While some temporal coverage gaps exist in the input SPL1CTB data, the SPL4SM product is processed continuously and does not have temporal coverage gaps. When SPL1CTB gaps occur, SPL4SM data are processed using information from SMAP observations assimilated prior to each gap in the input SPL1CTB data, as well as information from the land surface model. SMAP observations are assimilated in an EnKF analysis update step at the nearest 3-hourly analysis time such as 0z, 3z, ..., and 21z (where z indicates Zulu). A broad variety of geophysical parameters are provided as 3-hourly averages between these update times. Moreover, instantaneous forecast and analysis soil moisture and temperature estimates are provided along with the assimilated observations. These snapshots are nominally for 0z, 3z,…, or 21z. This section has been adapted from Reichle et al. 2014, the ATBD for this product. Additional documentation of the algorithm is provided by Reichle et al. 2017a and Reichle et al. 2017b. The primary SMAP measurements, land surface microwave emission at 1.41 GHz and radar backscatter at 1.26 GHz and 1.29 GHz, are directly related to surface soil moisture (in the top 5 cm of the soil column). Several of the key applications targeted by SMAP, however, require knowledge of root zone soil moisture (defined here as soil moisture in the top 1 m of the soil column), which is not directly linked to SMAP observations. The foremost objective of the SMAP Level-4 Surface and Root Zone Soil Moisture (SPL4SM) product is to fill this gap and provide estimates of root zone soil moisture that are informed by and consistent with SMAP observations. Such estimates are obtained by merging SMAP observations with estimates from a land surface model in a soil moisture data assimilation system. The land surface model component of the assimilation system is driven with observation-based surface meteorological forcing data, including precipitation, which is the most important driver for soil moisture. The model also encapsulates knowledge of key land surface processes, including the vertical transfer of soil moisture between the surface and root zone reservoirs. Finally, the assimilation system uses the land model to interpolate and extrapolate SMAP observations in time and in space. The SPL4SM product thus provides a comprehensive and consistent picture of land surface hydrological conditions based on SMAP observations and complementary information from a variety of sources. The assimilation algorithm considers the respective uncertainties of each component and, if properly calibrated, yields a product that is superior to both satellite and land model data. Error estimates for the SPL4SM product are generated as a by-product of the data assimilation system. The ATBD for this product provides a detailed description of the SPL4SM product, its algorithm, and how the product is validated. In addition, ancillary data sources used as input to calculating the SMAP Level-4 soil moisture products are obtained from the GMAO; these sources are listed in the ATBD, Section 4.1.3: Ancillary Data Requirements. Precipitation observations that are used to correct the GMAO precipitation estimates are obtained from the NOAA Climate Prediction Center (Reichle et al. 2017a, Reichle et al. 2017b). Utilizing the baseline data assimilation algorithm discussed below, input data sources are used with the SMAP Level-4 soil moisture model to provide enhanced estimates of surface soil moisture, root zone soil moisture, and related geophysical variables. The GEOS-5 Catchment Land Surface and Microwave Radiative Transfer Model is a numerical description of the water and energy transport processes at the land-atmosphere interface, augmented with a model that describes the land surface microwave radiative transfer (refer to section 4.1.1 of the ATBD: Reichle et al. 2014). The GEOS-5 Ensemble-Based Land Data Assimilation System is the tool used to merge SMAP observations with estimates from the land model as it is driven with observation-based surface meteorological forcing data. The SMAP Level-4 soil moisture baseline algorithm, described in detail in the ATBD, includes a soil moisture analysis based on the ensemble Kalman filter and a rule-based freeze/thaw analysis. However, data users should note that for Validated Version 4 data, the algorithm ingests only the SPL1CTB radiometer brightness temperatures, contrary to the planned use of downscaled brightness temperatures from the SPL2SMAP product and of landscape freeze-thaw state retrievals from the SPL2SMA product. The latter two products—SPL2SMAP and SPL2SMA—are based on radar observations and are only available for the period from 13 April 2015 through 07 July 2015 due to an anomaly that caused the premature failure of the SMAP L-band radar. Neither of these two radar-based products is assimilated in the SMAP Level-4 soil moisture algorithm. More information about error sources is provided in the ATBD under Section 4.1.2: Mathematical Description of the Algorithm. For more information on data product accuracy, refer to Reichle et al. 2017a, Reichle et al. 2017b, and the Validated Assessment Report from Reichle et al. 2018. SMAP Level-4 soil moisture data are generated by the GMAO located at the NASA Goddard Space Flight Center (GSFC), using the High-End Computing Facilities at the NASA Center for Climate Simulation (NCCS), also located at GSFC in Greenbelt, Maryland. SMAP SPL1CTB data are required for the baseline algorithm. Aside from SMAP observations, the data assimilation system requires initialization, parameter, and forcing inputs for the Catchment land surface model, as well as input error parameters for the ensemble-based data assimilation system. These ancillary data requirements are described in detail in the ATBD, Section 4.1.3: Ancillary Data Requirements. The precipitation observations used to correct the GMAO precipitation estimates are obtained from the NOAA Climate Prediction Center (Reichle et al. 2017a, Reichle et al. 2017b). Note that for this version, the model background precipitation forcing is rescaled to match the climatology of the Global Precipitation Climatology Project (v2.2), which results in substantial changes in the precipitation and soil moisture climatology in Africa and the high latitudes, where the gauge-based Climate Prediction Center Unified precipitation is not used. For more information on each portion of the algorithm processing flow, refer to the ATBD. SMAP products provide multiple means to assess quality. Uncertainty measures and file-level metadata that provide quality information are provided within each product. For details, refer to the Data Fields and Metadata Fields documents. Each HDF5 file contains file-level metadata. A separate metadata file with an .xml file extension is available from the NSIDC DAAC with every HDF5 file; it contains essentially the same information as the file-level metadata. In addition, a Quality Assessment (QA) file with a .qa file extension is provided for every HDF5 file. QA files contain spatial statistics across the SMAP Level-4 soil moisture products, such as the global minimum, mean, and maximum of each data field. Level-4 surface and root zone soil moisture estimates are validated to a Root Mean Square Error (RMSE) requirement of 0.04 m3 m-3 after removal of the long-term mean bias. This accuracy requirement is identical to Level-2 soil moisture product validation and excludes regions with snow and ice cover, frozen ground, mountainous topography, open water, urban areas, and vegetation with water content greater than 5 kg m-2. Research outputs (not validated) include the surface meteorological forcing fields, land surface fluxes, soil temperature and snow states, runoff, and error estimates that are derived from the ensemble. Quality control is also an integral part of the soil moisture assimilation system. Two kinds of quality control (QC) measures are applied. The first set of QC steps is based on the flags that are provided with the SMAP observations. Only SMAP brightness temperature data that have favorable flags for soil moisture estimation are assimilated, such as acceptably low vegetation density, no rain, no snow cover, no frozen ground, no RFI, sufficient distance from open water, etc. The second set of QC steps are additional rules that exclude SMAP observations from assimilation in the EnKF soil moisture update whenever the land surface model indicates that (1) heavy rain is falling, (2) the soil is frozen, or (3) the ground is fully or partly covered with snow. The assimilation system will typically provide some weight to the model background and thus buffers the impact of anomalous observations that are not caught in the flagging process. Note: Brightness temperature observations from Version 4 SPL1CTB granules that have known deficiencies were excluded from assimilation in the Version 4 SPL4SM algorithm. For more quality control information, refer to the Data Fields document. The data assimilation system weighs the relative errors of the assimilated lower-level product (such as radiance or retrieval) and the land model forecast. Estimates of the error of the assimilation product are dynamically determined as a by-product of this calculation. How useful these error estimates are depends on the accuracy of the input error parameters and needs to continue to be determined through validation; refer to the ATBD, Section 4.2.4. The target accuracy of the assimilated brightness temperatures is discussed in the SPL1CTB product documentation. Error estimates of the land surface model and required input error parameters are discussed in the ATBD for this product. Each instantaneous land model field is accompanied with a corresponding instantaneous error field which is provided for select variables. The relevant outputs are listed in the Data Fields document for the SPL4SMAU product. Specifically, the error estimates are derived from the ensemble standard deviation of the analyzed fields. For soil moisture, the ensemble standard deviation is computed from the analysis ensemble in volumetric units (m3 m-3). For temperatures, the ensemble standard deviation is provided in units of kelvin. These error estimates will vary in space and time. For a detailed description of the SMAP instrument, visit the SMAP Instrument page at the JPL SMAP website. Crow, W. T., F. Chen, R. H. Reichle, and Q. Liu. 2017. L Band Microwave Remote Sensing and Land Data Assimilation Improve the Representation of Prestorm Soil Moisture Conditions for Hydrologic Forecasting. Geophysical Research Letters. 44:5495-5503. https://dx.doi.org/10.1002/2017GL073642. Crow, W. T., F. Chen, R. H. Reichle, Y. Xia, and Q. Liu. 2018. Exploiting soil moisture, precipitation and streamflow observations to evaluate soil moisture/runoff coupling in land surface models. Geophysical Research Letters. 45, in press, https://doi.org/10.1029/2018GL077193. De Lannoy, G. J. M., and R. H. Reichle. 2016. Assimilation of SMOS Brightness Temperatures or Soil Moisture Retrievals into a Land Surface Model. Hydrology and Earth System Sciences. 20:4895-4911. Hydrol. Earth Syst. Sci., 20:4895-4911. https://dx.doi.org/10.5194/hess-20-4895-2016. De Lannoy, G. J. M., and R. H. Reichle. 2016. Global Assimilation of Multiangle and Multipolarization SMOS Brightness Temperature Observations into the GEOS-5 Catchment Land Surface Model for Soil Moisture Estimation. Journal of Hydrometeorology, 17:669-691. https://dx.doi.org/10.1175/JHM-D-15-0037.1. Entekhabi, D., R. H. Reichle, R. D. Koster, and W. T. Crow. 2010. Performance Metrics for Soil Moisture Retrievals and Application Requirements. Journal of Hydrometeorology. 11:832–840. https://dx.doi.org/10.1175/2010JHM1223.1. Koster, R. D., Q. Liu, S. P. P. Mahanama, and R. H. Reichle. 2018. Improved Hydrological Simulation Using SMAP Data: Relative Impacts of Model Calibration and Data Assimilation. Journal of Hydrometeorology. In press. https://dx.doi.org/10.1175/JHM-D-17-0228.1. Reichle, R. H., et al. 2017a. Assessment of the SMAP Level-4 Surface and Root-Zone Soil Moisture Product Using In Situ Measurements. Journal of Hydrometeorology 18:2621-2645. http://dx.doi.org/doi:10.1175/JHM-D-17-0063.1. Reichle, R. H., G. J. De Lannoy, Q. Liu, R. D. Koster, J. S. Kimball, W. T. Crow, J. V. Ardizzone, P. Chakraborty, D. W. Collins, A. L. Conaty, M. Girotto, L. A. Jones, J. Kolassa, H. Lievens, R. A. Lucchesi, and E. B. Smith. 2017b. Global Assessment of the SMAP Level-4 Surface and Root-Zone Soil Moisture Product Using Assimilation Diagnostics. Journal of Hydrometeorology , accepted. https://doi.org/10.1175/JHM-D-17-0130.1.